Skytopia : Greatest Optical Illusions Pictures. An intriguing selection of old, new and exclusive optical illusions. Many pictures are enhanced via the use of 3D and animation. Even though a few of the optical illusions here are already popular, I have enhanced many of them by animating them in some way - rotating, squashing, switching, sliding - you name it. Also, many of the optical illusions on display I've actually made myself =) (including... The "Rotating Dot Whirlpool", "Vision distorter", "The multi-square slicer", "Tube of Illusion", "Glowing Core", "Wheel of Confusion", "Eclipse of Mars", "Vanishing Fluff", the "Bulb Swap" thing and to some extent - the "Optical Blind Spot", "Tri-lock", "Crooked Skyscraper", "Multi-cube", "Flickering Fog" and "Magic Zoomster"). At first, there doesn't seem anything unusual about this picture. I mean, it's just a bunch of diagonal lines and a slightly distorted square in the middle - right? Wrong. Believe it or not, the 4 lines that make up the square are actually perfectly straight. In fact it /is/ a perfect square. For proof of this, the animation will swap between the two frames so you can see the square remains the same. Also check by loading the pic into your favourite art package. Each of the 3 curves shown below are sections of the circle. Which would form the largest circle though? All these tracks look as though they've come from a broken down railway track, but in actual fact, they are perfectly parallel! To prove they really are parallel, watch the small 'hairs' gradually disappear. You will see the lines as how you would expect them to be. This amazing illusion to the right was created by Akiyoshi Kitaoka. It already looks quite 'wavy', but try slowly moving the mouse cursor up and down the center of the image - and focus on the cursor. You should see the picture 'waving' in an incredible way. 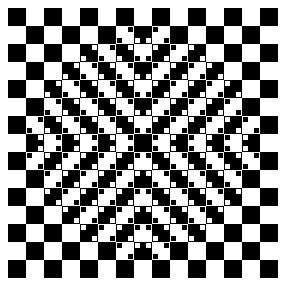 for more optical illusions in this style. 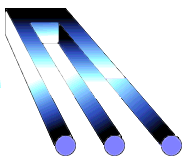 Also created by Akiyoshi, the lines in this picture below are completely parallel would you believe? What does this simple green signpost say? the page for the answer. Now this is clever, even for those who think they know what's going on here. Take a look at the diagram - how many cubes can you see? You can give 1 or 2 answers, but you are not allowed to count 'overlapping' cubes as part of any one total. As soon as you think you know the answer/s, click the picture for the full optical illusion and be amazed. Look into the centre (white point) and stare for a while. How many colours can you see altogether in the object? You should see a purplish circle... and the 4 rotating 'wings' are tinted green. Make sure you always keep focused on the centre. Are those four wings really green? Amazingly, they are exactly the same colour as the circle inside. Don't believe me? Well try following one of the wings round. You'll see that the colour matches the inner circle perfectly. NB. The faster the circle rotates, the better the illusion will work. Unfortunately, Explorer has great trouble displaying GIF animations faster than about 10 frames per second, so I suggest saving the anim and then using an external such as Irfanview. Visit www.irfanview.com for more details. from a to b, or from b to c? Amazingly, they're both the same length. This is perhaps the most extreme example of I have found that distorts perception of length. Which semicircle is brighter - the left or the right half? Can you see dark blotches on the white 'junctions' in between the corners of these black squares? One of the most famous optical illusions, reproduced in colour! 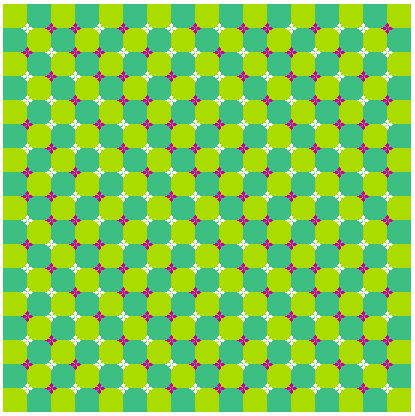 Green Fade illusion Another illusion I created, or rather discovered accidentally, but it turns out it's a superior version of an illusion already discovered Cornsweet illusion, also known as Craik-O'Brien-Cornsweet illusion . You'll need to have your PC in 24 bit colour to see it properly. It looks as though the green bar above is getting lighter further to the right. But in actual fact, it's exactly the same shade on the far right as it is on the far left..... "Light Green" really does equal "Dark Green"! See a new colour you've never seen before!! Stare at the white dot in the centre of the red circle. The longer - the better (two minutes and you'll get a much stronger effect). Always try to keep focused on the white dot. It'll be worth it. Soon after staring, you'll start to see a thin rim of light around the edge. Don't stop staring though yet! Wait another minute - keeping your head perfectly still. The blue/cyan colour chart to the right isn't part of the illusion, but there to demonstrate that the ultra cyan you have just seen is not in the monitor's color palette! It should be, but isn't. It's an amazing effect and something I created whilst researching the problem with monitors and their inability to display real cyan. These 2 colours (red and this exact shade of cyan) work better than any other colour combination for many reasons. 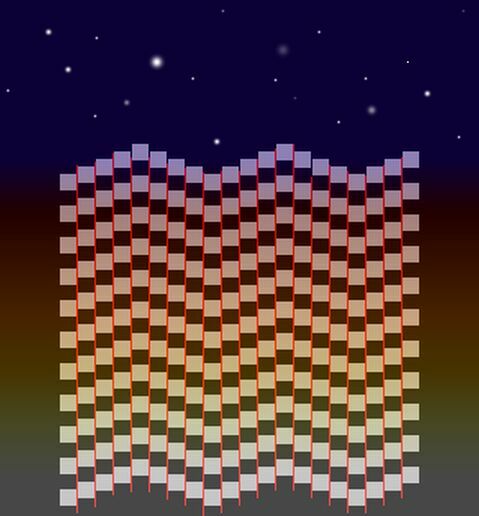 Also visit Skytopia's very own Light and Colour trivia page which speaks about and demonstrates effects similar to this illusion. the Eclipse of Titan (luminous green!) and Eclipse of Neptune (firey!) on our new page. All of the red lines are completely parallel would you believe? OK, this one really belongs in the Skytopia 3D stereoscopic gallery, but I just couldn't resist. If you can cross your eyes, so that both pictures slide 'into' each other - to form a third, 3D image between them, the effect you will see is truly stunning! Try focusing on something in between you and the monitor to help see the illusion. If you're still stuck and you really want to see the illusion, try this site to help practise seeing 3-D stereo. If you can't manage to see this cross eyed version below, then try the parallel version here. 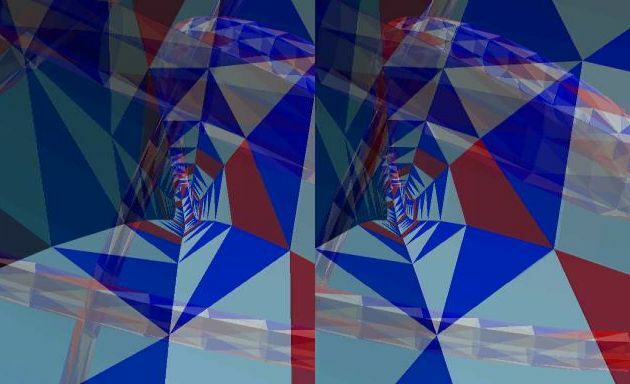 For this parallel version you look behind the monitor and just like the cross eyed version - try to get the two tubes to match up. Unfortunately though, it needs to be made around four times as small due to the nature of parallel vision. Which way is the wheel turning!? Focus on the red dots and follow them round... it appears to be rotating anti-clockwise. However, if you follow the yellow dots round instead, the whole wheel will be turning the other way! - clockwise! This cool optical illusion has been seen before, but I've spruced it up by adding colour, multiple layers, and making it bigger!! The idea is to focus on the dot in the centre and then move your head constantly towards and away from the monitor. You should see the circles rotate spookily! Press the F11 key in your browser to see the illusion at full screen! 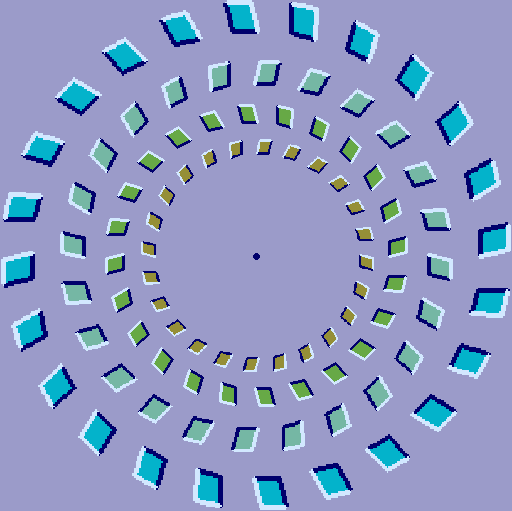 For more optical illusions similar to this one, visit Akiyoshi Kitaoka's Rotational illusion page. If you enjoyed that, we have a much better and more effective version (on top of other fascinating new lllusions!) as shown here. 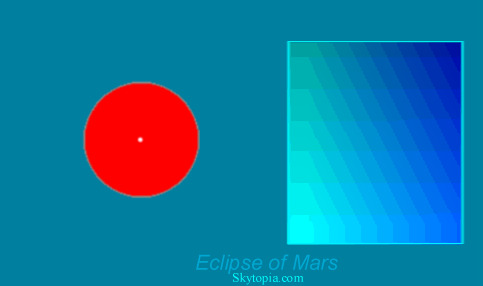 Just like you did for the Eclipse of Mars, stare intently at the red dot in the center of the left block for about a couple of minutes. Once you've done this, look over to the center of the right block. It should act weird - by fading out and 'flickering'. If you move your head closer and further from the monitor (while focussing in the center), you should see some interesting interference effects too. If you like the optical illusions on this page, then you'll probably want to see the new special set. (We've slaved away over the past year on these, and believe that they are amongst the cream of illusions found anywhere in the world (internet or otherwise)). The optical illusions that have been created by myself on this page and this page are copyright 2002 onwards D. White. If you wish to use any of them, then please contact me for permission.